Image: Event Horizon Telescope collaboration et al. 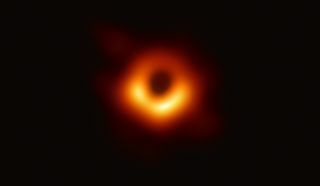 An extraordinary scientific feat has been achieved, as a revolutionary astrophotography technique has enabled astronomers to capture the first ever photograph of a black hole – a phenomenon that has, until now, been unseeable. The image depicts the shadow of a supermassive black hole against a disc of glowing gas, 55 million light years away from Earth, at the center of the enormous Messier 87 galaxy in the Virgo cluster. "This is a huge day in astrophysics," said National Science Foundation director, France Córdova. "We're seeing the unseeable. Black holes have sparked imaginations for decades. They have exotic properties and are mysterious to us. Yet with more observations like this one they are yielding their secrets. "This is why NSF exists. We enable scientists and engineers to illuminate the unknown, to reveal the subtle and complex majesty of our universe." The image was made possible thanks to the revolutionary Event Horizon Telescope (EHT) – a planet-scale array of eight ground-based radio telescopes across the world, including volcanoes in Hawaii and Mexico, mountains in Arizona and the Spanish Sierra Nevada, the Chilean Atacama Desert, and Antarctica. The question is, with black holes being infamously invisible (being phenomena from which light cannot escape), how is it possible to see one even using a telescope the size of the Earth? "If immersed in a bright region, like a disc of glowing gas, we expect a black hole to create a dark region similar to a shadow – something predicted by Einstein's general relativity that we've never seen before," explained Heino Falcke, chair of the EHT Science Council. "This shadow, caused by the gravitational bending and capture of light by the event horizon, reveals a lot about the nature of these fascinating objects and allowed us to measure the enormous mass of M87's black hole." Identifying and imaging that shadow, which persisted over multiple independent Event Horizon Telescope observations, was central to the breakthrough. "Once we were sure we had imaged the shadow, we could compare our observations to extensive computer models that include the physics of warped space, superheated matter and strong magnetic fields," added Paul T.P. Ho, EHT Board member. "Many of the features of the observed image match our theoretical understanding surprisingly well. This makes us confident about the interpretation of our observations, including our estimation of the black hole's mass." "We have achieved something presumed to be impossible just a generation ago," concluded Sheperd S Doeleman, EHT project director. "Breakthroughs in technology, connections between the world's best radio observatories, and innovative algorithms all came together to open an entirely new window on black holes and the event horizon." Astronomy Photographer of the Year winners are out of this world!